Consider the following decision problem: for a given monotone Boolean function f decide, whether f is read-once. For this problem, it is essential how the input function f is represented. Elbassioni et al. (J. Comb. Optim. 22(3), 293–304, 2011) proved that this problem is coNP-complete when f is given by a depth-4 read-2 monotone Boolean formula. Gurvich (2010) proved that this problem is coNP-complete even when the input is the following expression: C ∨ Dn, where Dn = x1y1 ∨ … ∨ xnyn and C is a monotone CNF over the variables x1, y1, … , xn, yn (note that this expression is a monotone Boolean formula of depth 3; in Gurvich (2010) nothing is said about the readability of C, but the proof is valid even if C is read-2 and thus the entire formula is read-3). 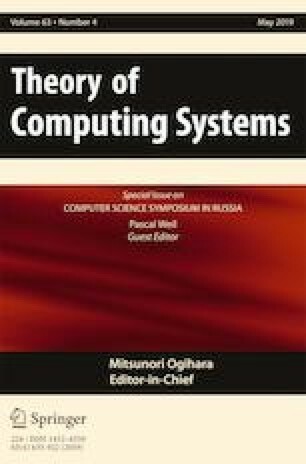 We show that we can test in polynomial-time whether a given expression C ∨ D computes a read-once function, provided that C is a read-once monotone CNF and D is a read-once monotone DNF and all the variables of C occur also in D (recall that due to Gurvich, the problem is coNP-complete when C is read-2). We also observe that from the so-called Sausage Lemma of Boros et al. (2009) it follows that the problem of recognizing read-once functions is coNP-complete when the input formula is depth-3 read-2. The study has been funded by the Russian Academic Excellence Project ’5-100’. Supported in part by the Russian Foundation for Basic Research grant 16-01-00362. The preliminary version of this paper was accepted for presentation at CSR 2018. The author would like to thank Nikolay Vereshchagin and Alexander Shen for help in writing this paper. The author would like to thank Vladimir Gurvich for pointing out to .